Back in week 2 of #etmooc Dean Shareski did a session on sharing, at the time I was a bit distracted, I was packing up to head out to #educon early the next AM. I listened along noncommittally…Dean presented several seemingly simple suggestions, which successfully lodged in my brain (think tapeworm cyst in meat, later hatching when conditions are optimal, sorry, Biology teacher metaphor). I will only focus on one of his suggestions on sharing although his other suggestions did impact my thinking and actions around sharing. But this one sneaky slide was the one that stuck, in that splinter-y way, that new ideas often do. and…Professional learning (what is professional learning? Learning is personal, no matter what I learn about?) comes with an obligation to share? What?? I share lots and lots, at least I think I do? Learning is mine, I don’t need to share it….unless I want to…it’s completely personal, like private property, no way…does not need to be shared…ALL THE TIME. I didn’t get it….AT ALL…and in that harried moment, I was just kind of annoyed…NEXT. Over the past month, I began to see how profoundly accurate this deceptively simple, but deliciously nuanced, slide was and is. As I scanned my life for evidence of sharing and learning, I discovered, I shared most regularly and openly about my learning, in the classroom with my students; my learning is shared in my teaching, through my teaching, while teaching. I also noted working IN the classroom with living, breathing, reactive teenagers, was where I experienced my richest most insightful learning. As I carried along with this observation, watching for more data on learning and sharing in my daily life, I noticed that occasions where I shared my learning most openly, were also the ones that (seemed to) afford students wider doorways into their own learning; nodding heads, alert body language, focused eyes. 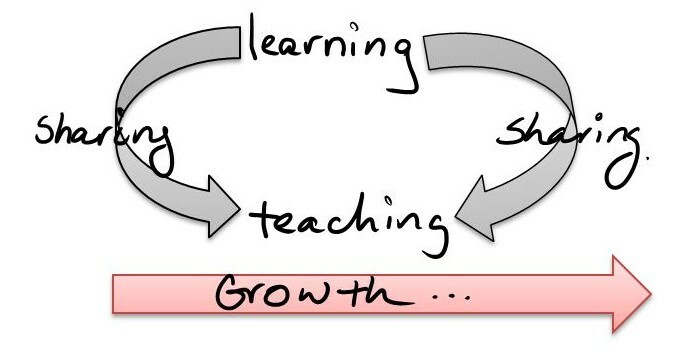 My clearest teaching moments (those when in the flow with kids and class) were ones more closely associated with moments of sharing from my own learning and then the very natural chain reaction of students building on the sharing-learning to share insights of their own or trying new activities, habits, patterns. Maybe this is old news to you and I have been living in a cave, but this was a new shiny insight to me, no splinter or tapeworm cyst! What connects my learning, be it professional or not, and teaching, is sharing openly; open heart, open mind, little i (as opposed to big I). Sharing as teaching, with an interactive audience, pulls me back quickly (like that last kiss goodbye both surprising but joyful) and frequently to learner mode; a rolling ball down the growth continuum, always pulled by sharing between, learner-teacher, learner-teacher. Do you see it? Does it make sense? Is it like this for you? Where in your life do you do you share “no holds barred”? Is it the same place you do your best learning? 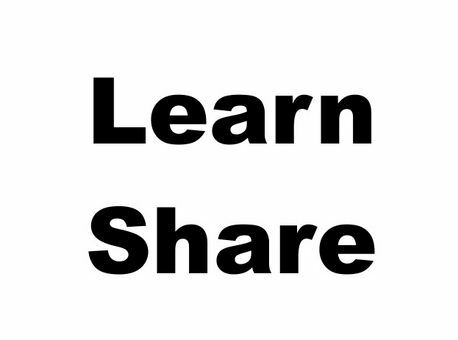 Is your learning and sharing evenly distributed over all areas of your life?